What Day Of The Week Is November 12? 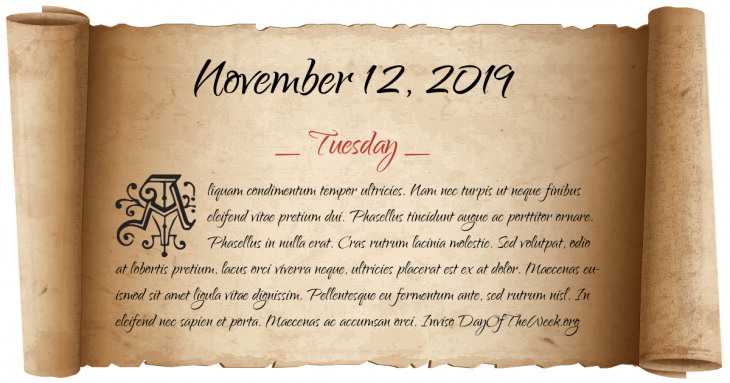 November 12, 2019 is the 316th day of the year 2019 in the Gregorian calendar. There are 49 days remaining until the end of the year. The day of the week is Tuesday. Plymouth, England, becomes the first town incorporated by the English Parliament. Sebastian Viscaino lands at and names San Diego, California. Hermann Göring proposes plans to make Madagascar the “Jewish homeland”, an idea that had first been considered by 19th century journalist Theodor Herzl. World War II: The Soviet cruiser Chervona Ukraina is destroyed during the Battle of Sevastopol. World War II: The Royal Air Force launches 29 Avro Lancaster bombers in one of the most successful precision bombing attacks of war and sinks the German battleship Tirpitz, with 12,000 lb Tallboy bombs off Tromsø, Norway. Who were born on November 12?